With routing, perhaps more than with other branches of woodwork, holding the workpiece is sometimes the most difficult part of the job. Straightforward clamping is often impossible without fouling the path of the router, so other methods have to be used, the router mat being one of the most versatile. When you join boards to make a panel you have to clean the glue lines and finish the surface. If you place the panel on a router mat you can use a hand sanding block or a random orbital sander and the panel will stay put without clamping. 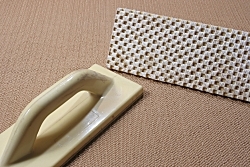 Cut pieces of router mat and, using contact adhesive, stick them to a flat board such as MDF. Mount a handle and you have a safety push block for use with saw tables, router tables, planer thicknessers etc. In addition to the above, you can cut small pieces of mat to give your arm more power to remove stubborn screw tops or to hand drive obstinate screws in tough material. 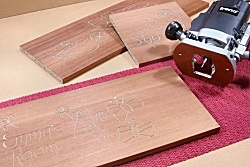 An excellent way to master your router is to practise free-hand routing. Put a V-groover or very narrow straight cutter into the collet, plunge to about 2mm and tilt the router into the wood. Draw a picture, write your name, and generally doodle using the router as a pencil. When you do, all the rules about correct direction of cut go out of the window; you’ll push the router, pull it, go sideways etc. – the aim is to keep it moving smoothly. 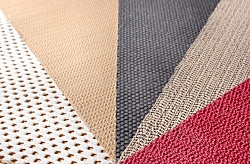 The mat holds scraps of board, veneered chipboard etc. without any clamps to get in the way of the router. 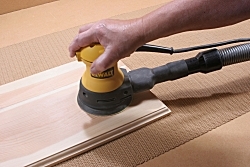 The router mat provides a non-slip cushion to place small units on for assembly, without marking their surface. 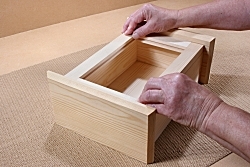 The grip is sufficient to allow you to do jobs such as cutting the hinge recesses for a cupboard door.